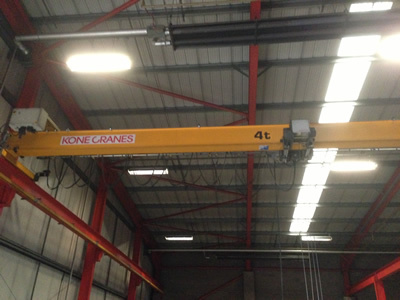 4t working load limit KONECRANES as new workshop crane. REF AG247. NOW SOLD, more used Konecranes wanted. Crane SOLD rail still for sale. Nearly new 4 tonne SWL KONECRANE AG247. Gantry rail and support columns to go with it. Hook from the floor 5040mm, hoist loss of 660mm. Crane Span; 11630mm, it can shortened or altered. 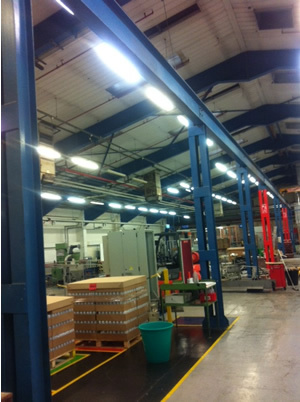 Universal beam to suit; In stock 5.5 meters in length c/w 50x 30 rail on top. 2x 11.7mts, 6mts one side. 6mts, 11.8mts, 4.4mts & 7.3mts length. 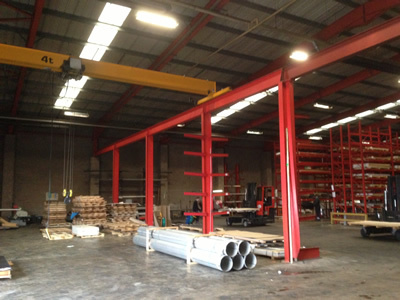 We also have 5 crane columns with this system plus some wall mounted knee joints. Free standing support steelwork (left) available. 2.5 tonne S.W.L. Second hand Konecrane specifications. Back to the used 1t and 2t crane page.